AGATHA AWARD NOMINATED SERIES "O'Brien has written one of the most warm-hearted yet realistic cozies I've ever had the pleasure of reading." - Mystery Scene Magazine (on Finding Sky) "This breezy second outing (after the Agatha Award-nominated Finding Sky) features an enchanting amateur sleuth with dear friends and family who have her back at all times. If only she can make this PI business work and keep her relationship with Dean on an even keel, her life will be perfect." - Library Journal "O'Brien combines humor, wit, wisdom, and suspense in a captivating story involving a rookie PI struggling to balance the demands of crime solving and single motherhood. No cookie-cutter mystery here. 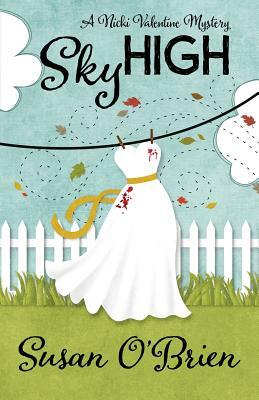 Sky High is a captivating tale of murder, abuse, betrayal, and refreshing redemption. Five stars plus " - Tracy Weber, Author of the Award-Winning Downward Dog Mystery Series "I love this series. Even though this is just the second book, I feel like I am hooked for the long haul. It is so well-written and the characters are so much fun that I just can't get enough." - Bookschellves "Breezy and fun with a charming heroine and a dashing hero." - Victoria Kemp, Flower Mound Public Library Single mom and rookie P.I. Nicki Valentine rarely gets time off, so attending a wedding with her superhot colleague Dean sounds dreamy. But things turn nightmarish when the groom-a soon-to-be transplant donor-disappears, and Nicki and Dean commit to a partnership they never planned. Together, they examine the groom's unfulfilled promises, including one to his mom, a psychic medium with an unusual health need. As family secrets emerge, Nicki must face questions about her late husband, whose long-ago betrayal still threatens to cloud her judgment. With support from her pole-dancing best friend, her always-on-call family, and the loves of her life (her two kids-and possibly Dean), Nicki must uncover the groom's demons while conquering her own. Related subjects include: women sleuths, private investigators, cozy mysteries, murder mysteries, humorous murder mysteries, book club recommendations, whodunit mysteries (whodunnit). Books in the Nicki Valentine Humorous Mystery Series: FINDING SKY (#1) SKY HIGH (#2) Part of the Henery Press Mystery Series Collection, if you like one, you'll probably like them all... Author Bio: Susan O'Brien has been passionate about reading and writing since childhood, when she started a neighborhood newspaper and escaped tween stress with mysteries. Since covering her first big story (the birth of gerbils next door), she has worked with USA TODAY, PI Magazine, The Parent Institute and others. Her debut mystery, Finding Sky, was an Agatha Award nominee for Best First Novel. Among her diverse interests are photography, gardening, loud R&B music, healing prayer and reality TV. She lives with her husband and children in the D.C. suburbs and donates part of her earnings to missing children's organizations.